Daenerys Targaryen, Mother of Dragons. She's here to claim her throne! Strikingly detailed 8-inch tall bust. Daenerys Targaryen, Mother of Dragons, has at long last made her journey across the seas to claim her throne, and in this elegantly hand-painted bust, her contemplative and strong presence comes across in striking detail. 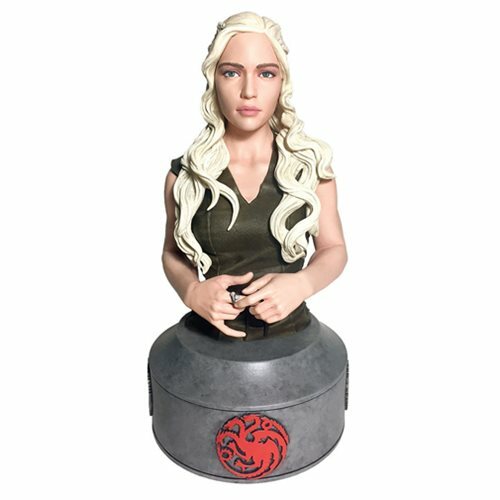 The 8-inch tall Game of Thrones Daenerys Targaryen Mother of Dragons Bust is a hand-numbered limited edition that comes with a certificate of authenticity. Ages 14 and up.